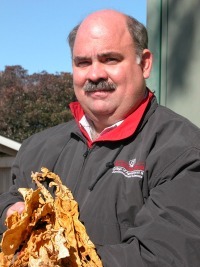 The University of Georgia Tobacco Team works together to provide agents and growers alike the most up-to-date and factual information on production, pest management, harvesting, curing and marketing of tobacco available. Educational programs conducted by the Tobacco Team have resulted in reduced maleic hydrazide (MH) residues and increased sucker control, the evaluation and adoption of baling cured leaf, and the conversion of curing barn furnaces to indirect heat using heat exchangers. The UGA Tobacco Team conducts annual update training for county Extension agents and an annual Georgia-Florida Tobacco Tour of on-farm demonstrations, research plots and grower farms to provide information to growers, agribusiness persons, county agents and tobacco industry personnel.